Why don't we know what happened? The initial confusion appears to have come from a teacher, who spoke to the press after the attack. He said the militants were searching for food, and not trying to kidnap anyone. The girls, he said, had run into the bush and were hiding. According to the BBC's Halima Umar, who is based in the capital Abuja, the government seems to have embraced this version of events, only accepting the girls had been kidnapped later on. However, the story became more confused when different branches of government and the army began diverging in their accounts - to the extent that the rescue of some girls was announced at a time when no official had acknowledged that any had been kidnapped. How many girls have been taken? One of the biggest arguments between parents of the missing girls and the authorities has been over the number of students taken. 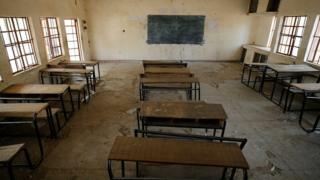 Parents insisted from the beginning more than 100 girls were missing from the school, which has 926 students. Authorities said the figure was as low as 40 and continued to say that many had run away into the bush and would no doubt reappear soon. In the end, fed up with the confusion, parents formed a group and produced a list of 105 names. The government has since come back and said the total number of missing girls is, in fact, 110. What are the parallels with the Chibok kidnappings? Will Ross, the BBC World Service Africa editor, noted chilling similarities to the April 2014 abductions in Chibok, some 275km (170 miles) south-east of Dapchi. On that occasion, he says, the military and the government initially denied the kidnappings and stayed silent as the jihadists drove more than 270 girls into the bush and set up camp. Four years on and the world is once again getting denials and misinformation from the authorities and disbelief and anger from the parents. Some in Nigeria have accused the government of being slow to respond or issue public statements. There is a feeling that no lessons have been learnt by current administration, which come to power partly because of the public anger over the way the previous government had handled the Chibok abduction, and the Boko Haram crisis more generally. More than 100 of the Chibok girls remain in captivity to this day. Whether the Nigerian authorities will be able to find, and rescue, the Dapchi girls remains to be seen. Why was there no security at the school? Despite the kidnap of the Chibok girls in April 2014, there doesn't appear to have been a security guard at the school in Dapchi. And yet, parents sent their daughters anyway. The BBC's Abuja reporter says this is down to a renewed sense of optimism which flooded in after Muhammadu Buhari's election in 2015, as well as repeated assurances the army was winning the battle against the Islamist militants. We also know there were soldiers guarding checkpoints near the town, because Yobe State Governor Ibrahim Gaidam told journalist the militants struck hours after the army withdrew their forces from checkpoints in Dapchi. The army has now confirmed it did remove the soldiers - and Nigerians want answers on who ordered soldiers to be withdrawn a day before the attack. Why can't they find the girls? It has taken a week for the government to accept the fact the girls have been taken and finally launch a large-scale search. President Buhari says troops and reconnaissance aircraft would be used and no stone left unturned in the hunt for the girls. They are refusing to give any further details of the search. But one local media outlet, the Daily Trust, reports that half the girls have already been whisked out of Nigeria and into neighbouring Niger by the militants. However, if they are still in Nigeria, our reporter believes they will have travelled to the Sambisa Forest - because, thanks to its vast size and thick tree coverage, it is the only place they can effectively hide. This is where Boko Haram had its headquarters, and where it took the Chibok girls. The Nigerian government says it has beaten Boko Haram - is that true? Major General Roger Nicholas, who leads operations in the north-east, declared the group had been "completely" defeated in January. This mass kidnapping suggests otherwise. BBC Africa's security correspondent Tomi Oladipo has previously pointed out these promises contradict the amount of money it is investing in new equipment to tackle the group, and the fact they are known to be active in the Lake Chad basin. Meanwhile, the BBC has been told that the army had been close to capturing Boko Haram's leader in January, but halted for a number of days before they were attacked. When they returned, the camp had cleared out. The army has strenuously denied the report.